Gozleme: Imagine a Turkish quesadilla made with feta-like cheese....om nom nom. 'Nefiste' was one of the first Turkish phrases I learned, right after learning how to say 'My name is Kirbie, nice to meet you.' It means 'It was delicious!' and you'd be surprised how many times a day I say this one simple phrase. The reason I'm raving on about the food, in foreign language, is that the food here is insanely delicious. I'm not sure I've been to a country where the food has been so delicious (except maybe Italy, because frankly, you can't beat a good slice of crispy crust, oozy cheese pizza). Traditional Turkish breakfast is a simple plate of olives, cheese, tomatoes and cucumber. While I don't eat this throughout the week, I'll sometimes linger over a plate of this while reading on my balcony on the weekends. I make Turkish çay (tea) to go with it. Lunch and supper can be a combination of bulger and seasoning, spiced chicken or vegetables and yogurt. Pide (Turkish flatbread) and lahmacun (Turkish pizza) also popular here, but tend to be laden with a mixture of ground beef and lamb, so they're not usually an option for me. 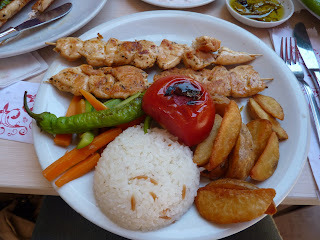 Turkey is not a very vegetarian-friendly country, but non-meat eaters can get by on sides and starters. 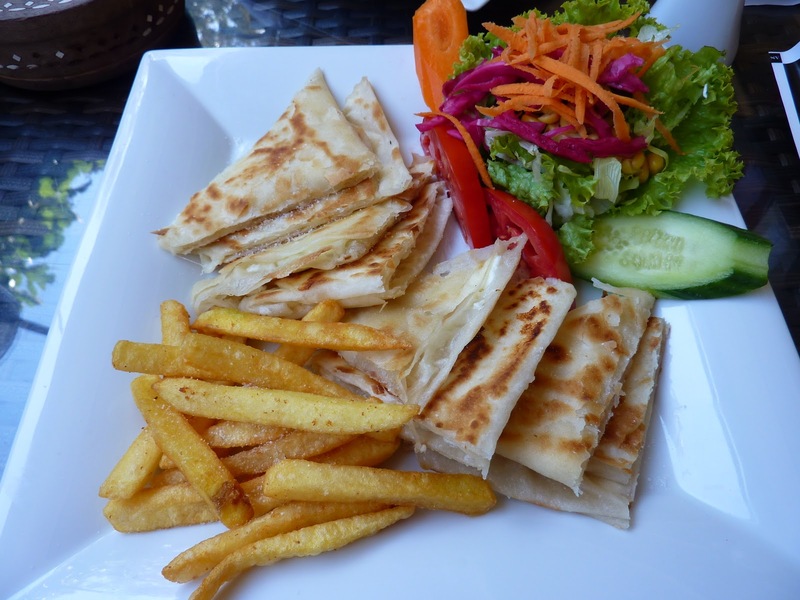 I found a very beautiful restaurant called Cafe des Cafes on Tunalı that serves delicious veggie burgers. The bread here is also 'nefis'. I'm particulary partial to the round rings of bread covered in sesame seeds called 'simit'. You can buy simit in the streets, it's sold out of a noticable little red cart, and you can usually get 3 for 1 TL. I've heard that in the early mornings in the city, men sell simit by piling them on top of a sort of hat-like carrying device on the heads and call out 'simit!' I desperately want to be up early in the morning in the city so I can get my hands on this hat-bread. Ramadan bread is also delicious, and I ate as much of this as I possibly could during Ramadan. I can't describe this bread, but it's white bread with a unique flavouring...almost sweet. So then there's Turkish ice cream...intensely flavoured (like lemon, chocolate and vanilla) and stretchy (they pull it out of a container on a stick, and stretch is like BREAD DOUGH! I don't know how this is possible, but this ice cream actually STRETCHES when you try to eat it. You try to lick it and it just gets pushed around with your tongue. You try to pull a bit off with your lips and it stretches. It doesn't melt easily in the heat, so it's perfect for those 30 degree days when you'd prefer not to wear your ice cream on your shirt. But seriously? Stretchy ice cream? Willy Wonka would be proud. What really gets me though are the desserts. First and foremost are what I'm going to call honey cakes. They may have been one of the reasons I moved here. I first ate these at the Bilkent cafeteria on East Campus and my heart has belonged to them ever since. The cakes/cookie like pastry is heavy and is made of what I think is almond paste. The cake is baked into an almond shape and then....soaked in a honey-like syrup. When you eat it it's heavy and sticky and I practically drool trying to get it into my mouth. I think these honey cakes are actually called 'lokma', but I'm not sure. I get so excited when I see them I don't even bother trying to find out the name, I just plunk this sucker on my tray as fast as I can. Next up is baklava. Ohhhh dear me, baklava. This is a delicious little sweet that involves philo pastry and a honey-like syrup (do you see a pattern here?). These little desserts are so unbelievable sweet you can almost feel your teeth aching as you're cramming it down your throat. On Sunday, we discovered this great little dessert shop conviently across from the grocery store where I sometimes ship. Eilidh was brave enough to ask (in our limited Turkish) for 200 grams (it's sold by weight) of this delicious Baklava and I managed to choke out the word 'bende' (which means 'the same'). We walked away happily with our pretty little dessert boxes filled with sweet tasting baklava, for a steal of only 5 TL! PS. I have some gorgeous pictures of all this food I've been eating but I'm unable to upload them right now. Will try again later. Kirbie...Can't believe you found something to beat Mom's chocolate chip cookies! Guess you won't be so excited to have them, after all the goodies you've been having there. Wish you could send me some! Wow. That thing in the first picture sounds amazing. I'm so envious. I've had that turkish pizza thing before too, delicious!